After seeing and reading about Crash Cramers awesome hopped up 'Dream Hotshot' a couple of weeks ago , it spurred me on to’ finish’ my vintage Hotshot. 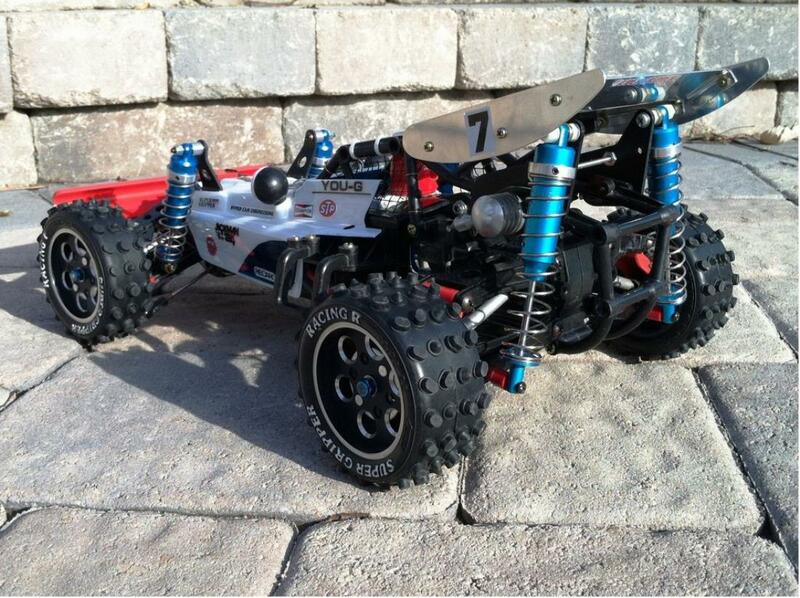 The Vintage chassis is used and generally in good shape. All the hop ups are NOS which I collected over the years. I love the black alloy wheels which was the starting point for this project. 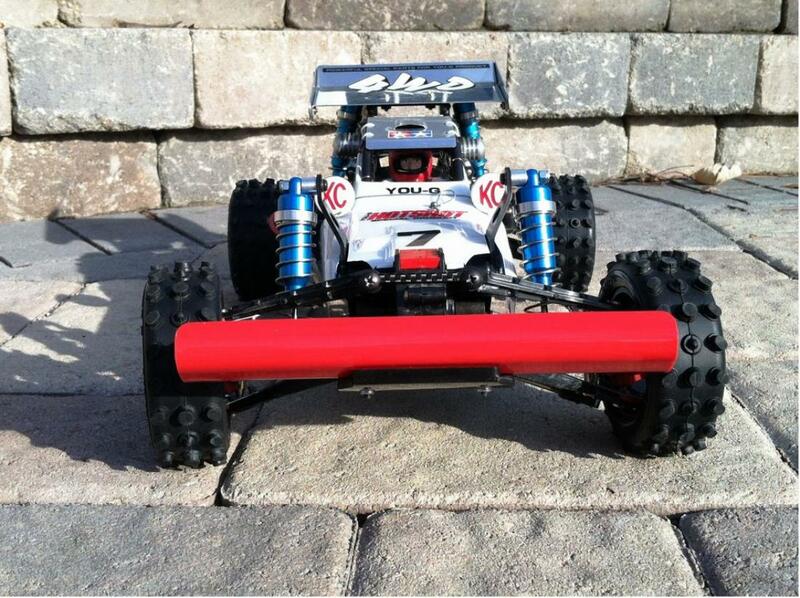 The front and rear shocks are You – G, with Parma front and rear shock towers. Said it before but You-G makes some super quality hop ups. Love how solid they are. Alloy hubs were sourced in on TC.. not sure who manufactures them, but I like them as they are alloy colored and match the wheels nicely I think. Front bumper is You-g, and the rear wing is Thorp DirtBurners. I’ve fitted the Parma bump steer eliminator kit too. 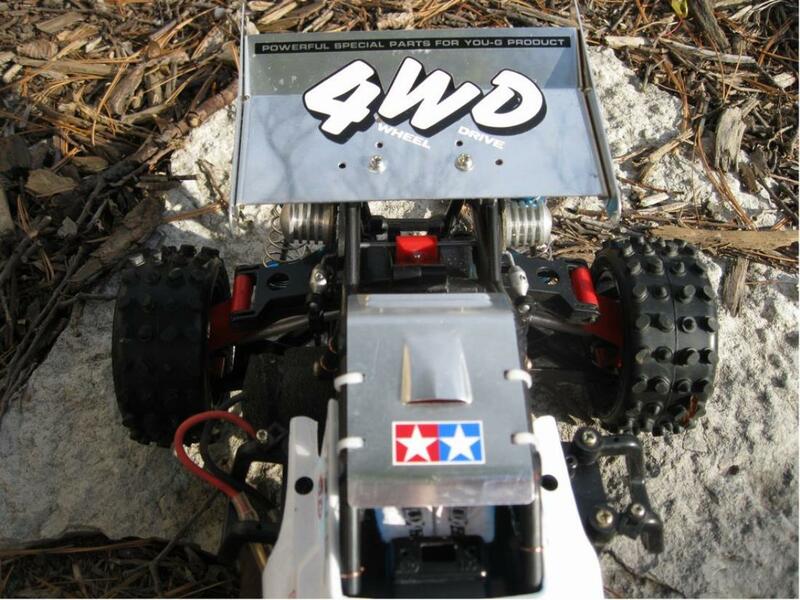 Motor is a dirt tuned Tamiya. I still have more parts to source and add, mostly for the gear boxes. I still need to install the Dirtburners alloy spindles ( steering knuckles) which are also NIP. Those took me years to find! I cracked open my vintage body set and went with a white & candy blue body and wanted to keep the decals mainly to a few colours. I have to re-fit the front sway bar, just need to cut the body a touch more to do so. Love the hotshot! This will go up on the block though as I just want one perfect runner! 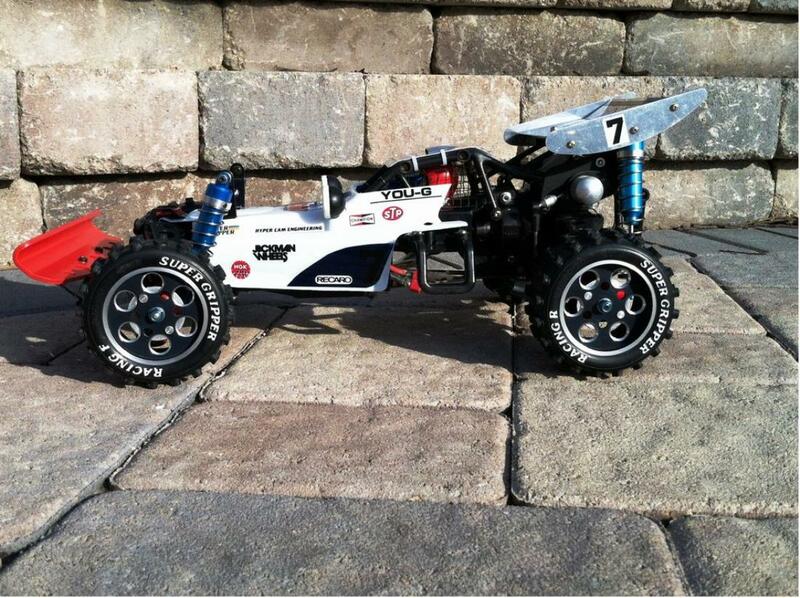 the white paint and dark wheels make it stand out from the rest of the crowd, very nice job. 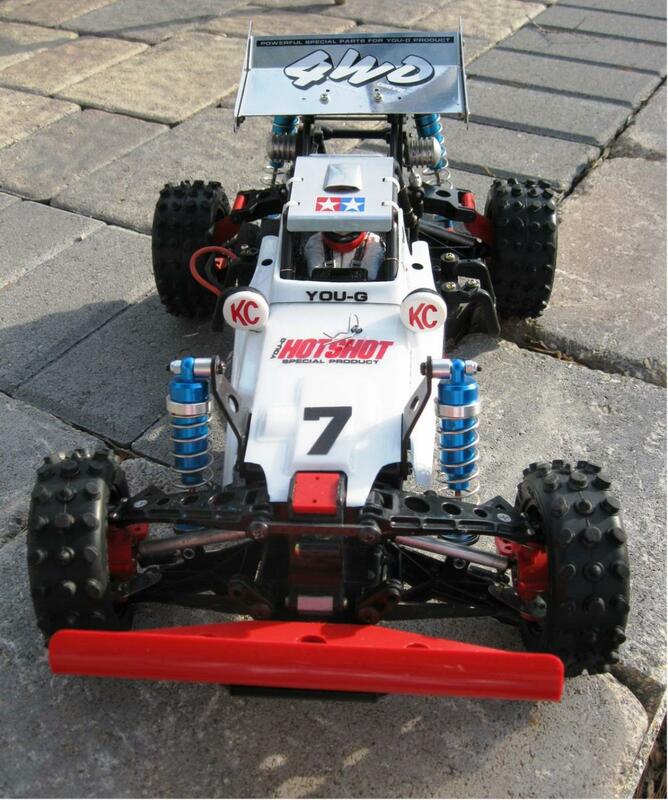 Nice looking Hotshot, I have done all of this and more to my re re boomerang. Watch those alloy hubs as they snap the axles, i have gone back to plastic as I now use UJ's. The alloy rear wing looks good but un-ballances the car with the weight so high up. 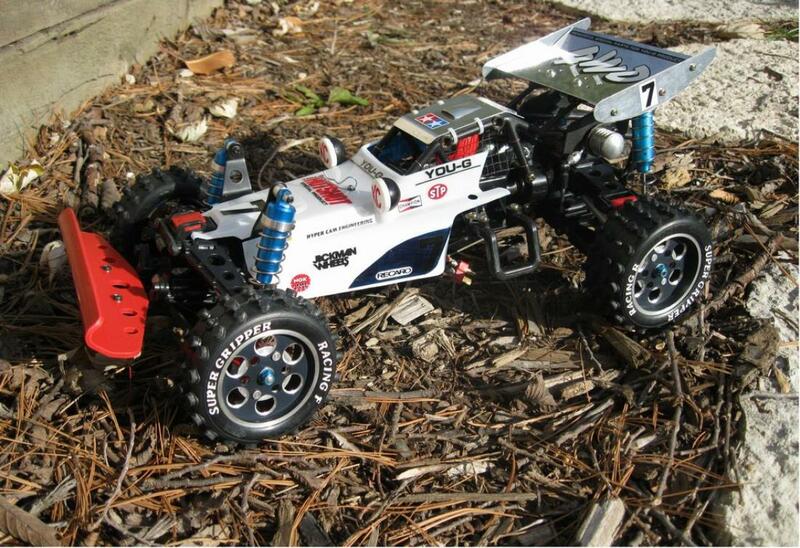 The car would also handle a lot better with a boomerang chassis to get rid of the horrible bump steer. That one makes mine look wimpy. That is one mean looking runner you have there. The B I G rear wing is one I have on a Fox, but thought it was a bit big for that car too. I really dig your You-G rear dampers, hope you still have the package header card as I want to know what part number it is since it is really different from my rear damper set. 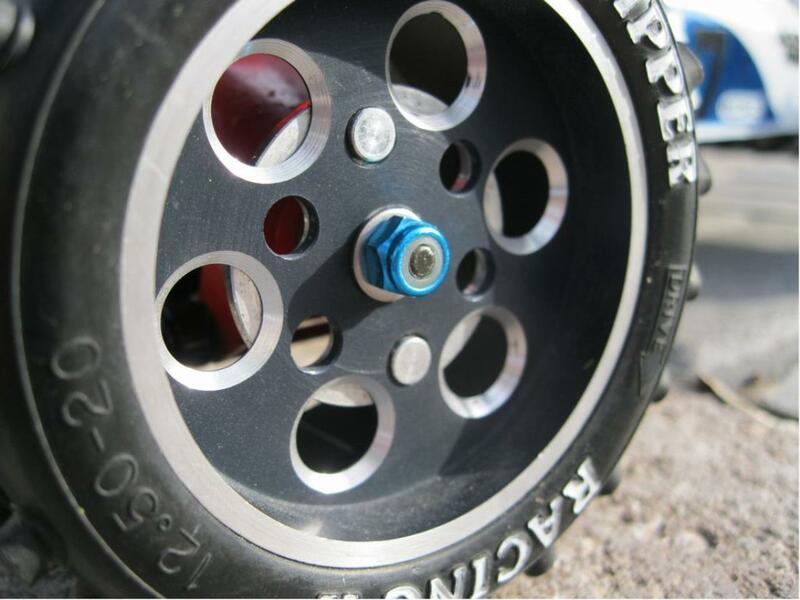 Which wheel hubs do you have on this?? I love your selection of decals, subtle but just right. Absolutely awesome!! I love all the hop-up parts on this. Thanks all, I had fun building it up and running it!. The wing sure is large, but I have a thing for large alloy wing! 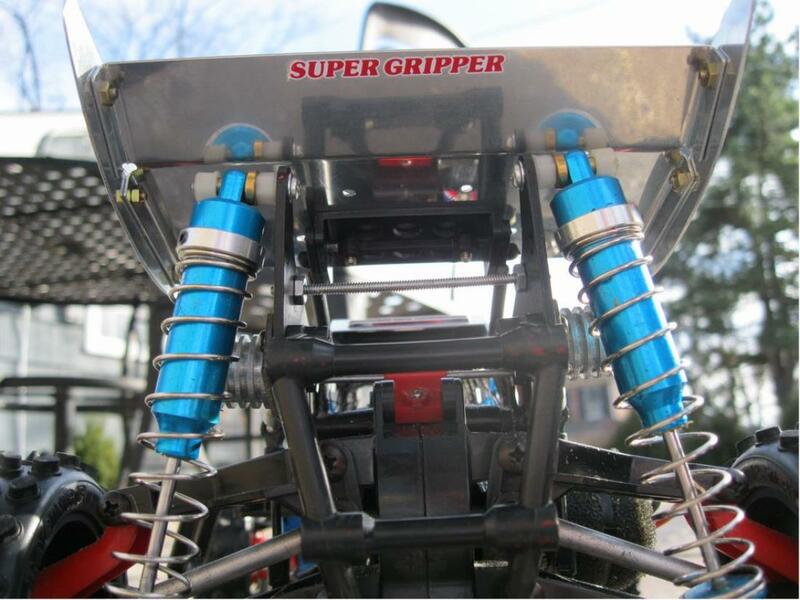 @Super Gripper, I'll watch for the alloy hubs. @ Crash Cramer... nah mate, your's is brilliant. I'm envious of the work you've done inside the gearboxes for sure! 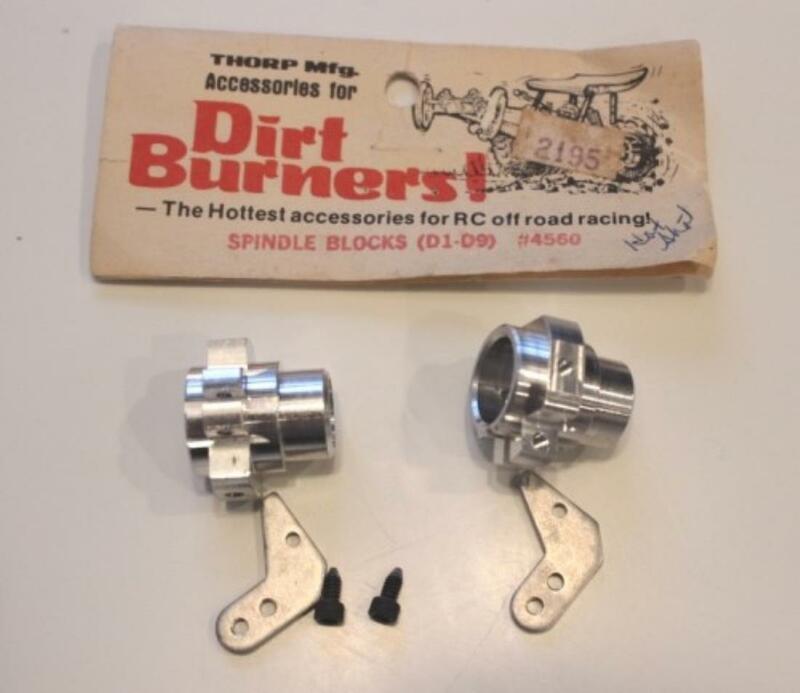 I have the header cards somewhere, and I'm pretty sure these were Boomerang rear shocks that I just took a gamble on. they work perfectly. AHH, that would explain it as the Boomer came with some pretty big CVA shocks to start with. Good gamble, time for a trip to Vegas. Still love looking at this, where did the carbon fibre front brace come from?? Custom home made? I think I took it from my DF-03... That was a long time ago!